Magnetic resonance imaging (MRI) is the newest, and perhaps most versatile, medical imaging technology available. Doctors can get highly refined images of the body's interior without surgery, using MRI. By using strong magnets and pulses of radio waves to manipulate the natural magnetic properties in the body, this technique makes better images of organs and soft tissues than those of other scanning technologies. MRI is particularly useful for imaging the brain and spine, as well as the soft tissues of joints and the interior structure of bones. The entire body is visible to the technique, which poses few known health risks. Detail. MRI creates precise images of the body based on the varying proportions of magnetic elements in different tissues. Very minor fluctuations in chemical composition can be determined. MRI images have greater natural contrast than standard x rays, computed tomography scan (CT scan), or ultrasound, all of which depend on the differing physical properties of tissues. This sensitivity lets MRI distinguish fine variations in tissues deep within the body. It also is particularly useful for spotting and distinguishing diseased tissues (tumors and other lesions) early in their development. Often, doctors prescribe an MRI scan to more fully investigate earlier findings of the other imaging techniques. Scope. The entire body can be scanned, from head to toe and from the skin to the deepest recesses of the brain. 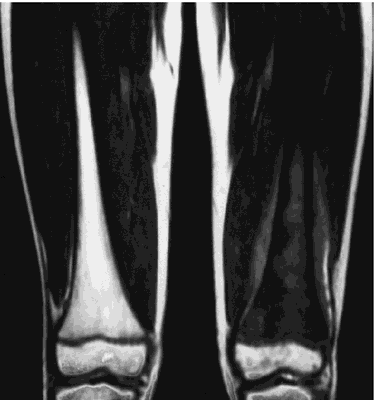 Moreover, MRI scans are not obstructed by bone, gas, or body waste, which can hinder other imaging techniques. (Although the scans can be degraded by motion such as breathing, heartbeat, and normal bowel activity.) The MRI process produces cross-sectional images of the body that are as sharp in the middle as on the edges, even of the brain through the skull. A close series of these two-dimensional images can provide a three-dimensional view of a targeted area. Safety. MRI does not depend on potentially harmful ionizing radiation, as do standard x-ray and CT scans. There are no known risks specific to the procedure, other than for people who might have metal objects in their bodies. 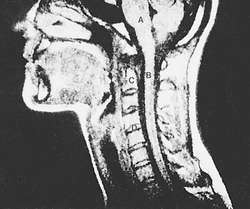 MRI is being used increasingly during operations, particularly those involving very small structures in the head and neck, as well as for preoperative assessment and planning. Intraoperative MRIs have shown themselves to be safe as well as feasible, and to improve the surgeon's ability to remove the entire tumor or other abnormality. Given all the advantages, doctors would undoubtedly prescribe MRI as frequently as ultrasound scanning, but the MRI process is complex and costly. The process requires large, expensive, and complicated equipment; a highly trained operator; and a doctor specializing in radiology. Generally, MRI is prescribed only when serious symptoms and/or negative results from other tests indicate a need. Many times another test is appropriate for the type of diagnosis needed. Brain and head. 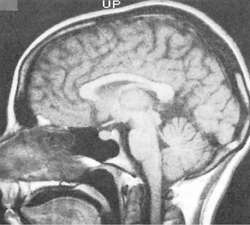 MRI technology was developed because of the need for brain imaging. It is one of the few imaging tools that can see through bone (the skull) and deliver high quality pictures of the brain's delicate soft tissue structures. MRI may be needed for patients with symptoms of a brain tumor, stroke, or infection (like meningitis). MRI also may be needed when cognitive and/or psychological symptoms suggest brain disease (like Alzheimer's or Huntington's diseases, or multiple sclerosis), or when developmental retardation suggests a birth defect. MRI can also provide pictures of the sinuses and other areas of the head beneath the face. Recent refinements in MRI technology may make this form of diagnostic imaging even more useful in evaluating patients with brain cancer, stroke, schizophrenia, or epilepsy. In particular, a new 3-D approach to MRI imaging known as diffusion tensor imaging, or DTI, measures the flow of water within brain tissue, allowing the radiologist to tell where the normal flow of fluid is disrupted, and to distinguish more clearly between cancerous and normal brain tissue. The introduction of DTI has led to a technique known as fiber tracking, which allows the neurosurgeon to tell whether a space-occupying brain tumor has damaged or displaced the nerve pathways in the white matter of the brain. This information in turn improves the surgeon's accuracy during the actual operation. Joint. MRI scanning is most commonly used to diagnose and assess joint problems. MRI can provide clear images of the bone, cartilage, ligament, and tendon that comprise a joint. MRI can be used to diagnose joint injuries due to sports, advancing age, or arthritis. MRI can also be used to diagnose shoulder problems, like a torn rotator cuff. MRI can also detect the presence of an otherwise hidden tumor or infection in a joint, and can be used to diagnose the nature of developmental joint abnormalities in children. Skeleton. The properties of MRI that allow it to see through the skull also allow it to view the inside of bones. It can be used to detect bone cancer, inspect the marrow for leukemia and other diseases, assess bone loss (osteoporosis), and examine complex fractures. The rest of the body. While CT and ultrasound satisfy most chest, abdominal, and general body imaging needs, MRI may be needed in certain circumstances to provide better pictures or when repeated scanning is required. The progress of some therapies, like liver cancer therapy, needs to be monitored, and the effect of repeated x-ray exposure is a concern. MRI scanning should not be used when there is the potential for an interaction between the strong MRI magnet and metal objects that might be imbedded in a patient's body. The force of magnetic attraction on certain types of metal objects (including surgical steel) could move them within the body and cause serious injury. Metal may be imbedded in a person's body for several reasons. Medical. People with implanted cardiac pacemakers, metal aneurysm clips, or who have had broken bones repaired with metal pins, screws, rods, or plates must tell their radiologist prior to having an MRI scan. In some cases (like a metal rod in a reconstructed leg) the difficulty may be overcome. Injury. Patients must tell their doctors if they have bullet fragments or other metal pieces in their body from old wounds. The suspected presence of metal, whether from an old or recent wound, should be confirmed before scanning. Occupational. People with significant work exposure to metal particles (working with a metal grinder, for example) should discuss this with their doctor and radiologist. The patient may need prescan testing-usually a single, regular x ray of the eyes to see if any metal is present. Chemical agents designed to improve the picture and/or allow for the imaging of blood or other fluid flow during MRA may be injected. In rare cases, patients may be allergic to or intolerant of these agents, and these patients should not receive them. If these chemical agents are to be used, patients should discuss any concerns they have with their doctor and radiologist. The potential side effects of magnetic and electric fields on human health remain a source of debate. In particular, the possible effects on an unborn baby are not well known. Any woman who is, or may be, pregnant should carefully discuss this issue with her doctor and radiologist before undergoing a scan. In essence, MRI produces a map of hydrogen distribution in the body. Hydrogen is the simplest element known, the most abundant in biological tissue, and one that can be magnetized. It will align itself within a strong magnetic field, like the needle of a compass. The earth's magnetic field is not strong enough to keep a person's hydrogen atoms pointing in the same direction, but the superconducting magnet of an MRI machine can. This comprises the "magnetic" part of MRI. Once a patient's hydrogen atoms have been aligned in the magnet, pulses of very specific radio wave frequencies are used to knock them back out of alignment. The hydrogen atoms alternately absorb and emit radio wave energy, vibrating back and forth between their resting (magnetized) state and their agitated (radio pulse) state. This comprises the "resonance" part of MRI. The MRI equipment records the duration, strength, and source location of the signals emitted by the atoms as they relax and translates the data into an image on a television monitor. The state of hydrogen in diseased tissue differs from healthy tissue of the same type, making MRI particularly good at identifying tumors and other lesions. In some cases, chemical agents such as gadolinium can be injected to improve the contrast between healthy and diseased tissue. Magnetic resonance spectroscopy (MRS) is different from MRI because MRS uses a continuous band of radio wave frequencies to excite hydrogen atoms in a variety of chemical compounds other than water. These compounds absorb and emit radio energy at characteristic frequencies, or spectra, which can be used to identify them. Generally, a color image is created by assigning a color to each distinctive spectral emission. This comprises the "spectroscopy" part of MRS. MRS is still experimental and is available in only a few research centers. Doctors primarily use MRS to study the brain and disorders, like epilepsy, Alzheimer's disease, brain tumors, and the effects of drugs on brain growth and metabolism. The technique is also useful in evaluating metabolic disorders of the muscles and nervous system. Regardless of the exact type of MRI planned, or area of the body targeted, the procedure involved is basically the same and occurs in a special MRI suite. The patient lies back on a narrow table and is made as comfortable as possible. Transmitters are positioned on the body and the cushioned table that the patient is lying on moves into a long tube that houses the magnet. The tube is as long as an average adult lying down, and the tube is narrow and open at both ends. Once the area to be examined has been properly positioned, a radio pulse is applied. Then a two-dimensional image corresponding to one slice through the area is made. The table then moves a fraction of an inch and the next image is made. Each image exposure takes several seconds and the entire exam will last anywhere from 30-90 minutes. During this time, the patient is not allowed to move. If the patient moves during the scan, the picture will not be clear. For the head and neck, a helmet-like hat is worn. For the spine, chest, and abdomen, the patient will be lying on the transmitters. For the knee, shoulder, or other joint, the transmitters will be applied directly to the joint. Additional probes will monitor vital signs (like pulse, respiration, etc.). The process is very noisy and confining. The patient hears a thumping sound for the duration of the procedure. Since the procedure is noisy, music supplied via earphones is often provided. Some patients get anxious or panic because they are in the small, enclosed tube. This is why vital signs are monitored and the patient and medical team can communicate between each other. If the chest or abdomen are to be imaged, the patient will be asked to hold his/her breath as each exposure is made. Other instructions may be given to the patient, as needed. In many cases, the entire examination will be performed by an MRI operator who is not a doctor. However, the supervising radiologist should be available to consult as necessary during the exam, and will view and interpret the results sometime later. In some cases (such as for MRI brain scanning or an MRA), a chemical designed to increase image contrast may be given by the radiologist immediately before the exam. If a patient suffers from anxiety or claustrophobia, drugs may be given to help the patient relax. The patient must remove all metal objects (watches, jewelry, eye glasses, hair clips, etc). Any magnetized objects (like credit and bank machine cards, audio tapes, etc.) should be kept far away from the MRI equipment because they can be erased. The patient cannnot bring their wallet or keys into the MRI machine. The patient may be asked to wear clothing without metal snaps, buckles, or zippers, unless a medical gown is worn during the procedure. The patient may be asked to remove any hair spray, hair gel, or cosmetics that may interfere with the scan. No aftercare is necessary, unless the patient received medication or had a reaction to a contrast agent. Normally, patients can immediately return to their daily activities. If the exam reveals a serious condition that requires more testing and/or treatment, appropriate information and counseling will be needed. A normal MRI, MRA, or MRS result is one that shows the patient's physical condition to fall within normal ranges for the target area scanned. Generally, MRI is prescribed only when serious symptoms and/or negative results from other tests indicate a need. There often exists strong evidence of a condition that the scan is designed to detect and assess. Thus, the results will often be abnormal, confirming the earlier diagnosis. At that point, further testing and appropriate medical treatment is needed. For example, if the MRI indicates the presence of a brain tumor, an MRS may be prescribed to determine the type of tumor so that aggressive treatment can begin immediately without the need for a surgical biopsy. Angiography — Any of the different methods for investigating the condition of blood vessels, usually via a combination of radiological imaging and injections of chemical tracing and contrasting agents. Diffusion tensor imaging (DTI) — A refinement of magnetic resonance imaging that allows the doctor to measure the flow of water and track the pathways of white matter in the brain. DTI is able to detect abnormalities in the brain that do not show up on standard MRI scans. Gadolinium — A very rare metallic element useful for its sensitivity to electromagnetic resonance, among other things. Traces of it can be injected into the body to enhance the MRI pictures. Hydrogen — The simplest, most common element known in the universe. It is composed of a single electron (negatively charged particle) circling a nucleus consisting of a single proton (positively charged particle). It is the nuclear proton of hydrogen that makes MRI possible by reacting resonantly to radio waves while aligned in a magnetic field. Ionizing radiation — Electromagnetic radiation that can damage living tissue by disrupting and destroying individual cells. All types of nuclear decay radiation (including x rays) are potentially ionizing. Radio waves do not damage organic tissues they pass through. Magnetic field — The three-dimensional area surrounding a magnet, in which its force is active. 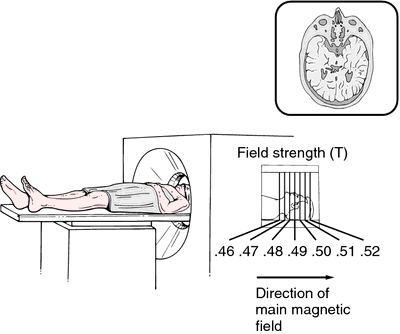 During MRI, the patient's body is permeated by the force field of a superconducting magnet. Radio waves — Electromagnetic energy of the frequency range corresponding to that used in radio communications, usually 10,000 cycles per second to 300 billion cycles per second. Radio waves are the same as visible light, x rays, and all other types of electromagnetic radiation, but are of a higher frequency. Clark, C. A., T. R. Barrick, M. M. Murphy, and B. A. Bell. "White Matter Fiber Tracking in Patients with Space-Occupying Lesions of the Brain: A New Technique for Neurosurgical Planning?" Neuroimage 20 (November 2003): 1601-1608. Hendler, T., P. Pianka, M. Sigal, et al. "Delineating Gray and White Matter Involvement in Brain Lesions: Three-dimensional Alignment of Functional Magnetic Resonance and Diffusion-Tensor Imaging." Journal of Neurosurgery 99 (December 2003): 1018-1027. Kubicki, M., C. F. Westin, P. G. Nestor, et al. "Cingulate Fasciculus Integrity Disruption in Schizophrenia: A Magnetic Resonance Diffusion Tensor Imaging Study." Biological Psychiatry 54 (December 1, 2003): 1171-1180. Mahmoud-Ghoneim, D., G. Toussaint, J. M. Constans, and J. D. de Certaines. "Three-Dimensional Texture Analysis in MRI: A Preliminary Evaluation in Gliomas." Magnetic Resonance Imaging 21 (November 2003): 983-987. Rees, J. "Advances in Magnetic Resonance Imaging of Brain Tumours." Current Opinion in Neurology 16 (December 2003): 643-650. Satoh, T., K. Onoda, and S. Tsuchimoto. "Intraoperative Evaluation of Aneurysmal Architecture: Comparative Study with Transluminal Images of 3D MR and CT Angiograms." American Journal of Neuroradiology 24 (November-December 2003): 1975-1981. American College of Radiology. 1891 Preston White Drive, Reston, VA 22091. (800) 227-5463. http://www.acr.org. American Society of Radiologic Technologists. 15000 Central Ave. SE, Albuquerque, NM 87123-3917. (505) 298-4500. http://www.asrt.org. Center for Devices and Radiological Health. United States Food and Drug Administration. 1901 Chapman Ave., Rockville, MD 20857. (301) 443-4109. http://www.fda.gov/cdrh. 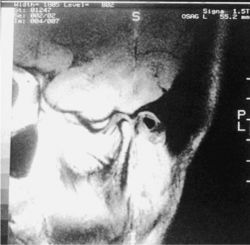 a noninvasive nuclear procedure for imaging tissues of high fat and water content that cannot be seen with other radiologic techniques. The MRI image gives information about the chemical makeup of tissues, thus making it possible to distinguish normal, cancerous, atherosclerotic, and traumatized tissue masses in the image. The patient having an MRI procedure lies in the bore of the cylindrical magnetic resonance machine; therefore, the test can induce claustrophobia. Furthermore, the person must lie motionless during the test, which can last from 15 to 90 minutes. If patients are susceptible to claustrophobia or cannot tolerate the tedium of lying still in a confined space, a sedative can be given without compromising test results. Magnetic resonance imaging. The patient enters a cylinder, which serves as a magnet. Radiofrequency coils within the cylinder emit signals that are transformed into an image of a display unit. Coronal view from magnetic resonance imaging (MRI). The MRI study provides anatomical information about the osseous and soft tissue extent of a tumor. From Thrall and Ziessman, 2001.
a diagnostic radiologic modality, using nuclear magnetic resonance technology, in which the magnetic nuclei (especially protons) of a patient are aligned in a strong, uniform magnetic field, absorb energy from tuned radiofrequency pulses, and emit radiofrequency signals as their excitation decays. These signals, which vary in intensity according to nuclear abundance and molecular chemical environment, are converted into sets of tomographic images by using field gradients in the magnetic field, which permits 3-dimensional localization of the point sources of the signals. medical imaging based on the resonance of atomic nuclei in a strong magnetic field. The field causes those nuclei with an odd number of protons to align and rotate around the axis of the field. Application of a radiofrequency pulse causes the protons to resonate. When the pulse is terminated, the protons "relax" back toward equilibrium. As they do so, they release energy that is detected as a radio signal. Analysis of the amplitude and frequency of the signal yields information about the number and position of nuclei in the tissue, from which the image is produced. MRI is the method of choice for a growing number of disease processes. Among its advantages are its superior soft-tissue contrast resolution, ability to image in multiple planes, and lack of ionizing radiation hazards. MRI is regarded as superior to computed tomography for most central nervous system abnormalities, particularly those of the posterior fossa, brainstem, and spinal cord. It has also become an important tool in musculoskeletal and pelvic imaging. The procedure usually does not require a contrast medium but may use an IV injection of gadolinium. About 15% of patients require an anxiolytic to overcome claustrophobia during MRI, and children may need a sedative as well. Patients must remain motionless for high-quality imaging. Images also may be degraded by motions related to heart contractions, respiration, and bowel peristalsis. Contraindications to MRI are pacemakers, metallic aneurysm clips, and some metallic prostheses and foreign objects. Also called zeugmatography. Compare open magnetic resonance imaging. See also magnetic resonance. Imaging A noninvasive technique for imaging anatomic structures which involves placing a person in a strong magnetic field and then, using magnetic gradients and brief radiofrequency pulses, determining the resonance characteristics at each point in the area being studied; the creation of images by magnetic resonance–MR, which is a function of the distribution of hydrogen nuclei–protons in the body; the MR image is a computerized interpretation of the physical interaction of unpaired protons with electromagnetic radiation in the presence of a magnetic field; although both have multiplanar capabilities, MRI often trumps CT: no ionizing radiation; contrast between normal and pathologic tissue is greater; confounding bone artifacts do not occur; rapidly moving components appear dark, therefore blood flow through large vessels can be analyzed as a type of natural contrast; the images derive from analysis of the amplitudes and frequencies of the weak signals produced by MR, allowing deduction of the sample's chemical composition, with protons providing the best images. See Burst MRI, Diffusion-weighted imaging, Dynamic imaging, Perfusion-weighted imaging, Short-bore MRI. A diagnostic modality in which the magnetic nuclei (especially protons) of a patient are aligned in a strong, uniform magnetic field, absorb energy from tuned radiofrequency pulses, and emit radiofrequency signals as their excitation decays. These signals, which vary in intensity according to nuclear abundance and molecular chemical environment, are converted into sets of tomographic images by using field gradients in the magnetic field, which permits three-dimensional localization of the point sources of the signals. Unlike conventional radiography or computed tomography, MRI does not expose patients to ionizing radiation. An important method of body scanning offering a degree of resolution of detail unequalled by any other method. The body is exposed to an intense magnetic field which forces spinning atomic nuclei into a standard orientation. Brief radio waves (electromagnetic signals) applied to the body cause certain atoms, especially the hydrogen in water, to take up a new alignment. In returning to the standard orientation these atoms emit small radio waves that can be picked up and their origin computed. The MRI scanner then reconstitutes images of cross-sections of the body in much the same way as does the CT scanner. The MRI scanner is capable of resolving subtle abnormalities in soft tissue such as brain and nerves. The characteristic plaques of multiple sclerosis, for instance, are clearly revealed as is an area of brain deprived of its blood supply. No ionizing radiation is involved. See also CT SCANNING. Non-invasive method of imaging part of the body to facilitate diagnosis and therapy. Unlike other radiological methods, this technique does not expose the patient to ionizing radiations. It depends instead on a strong magnetic field which induces the spins of atomic nuclei within the body (e.g. hydrogen atoms) to align themselves along the axis of the magnetic field. When exposed to a pulse of electromagnetic energy at a specific radio frequency, the nuclear spins tilt momentarily then regain their original orientations thus re-emitting an electromagnetic signal at the same radio frequency, which can be detected and analysed to generate a three-dimensional image. The rate at which the radio frequency signal decays can be used to characterize the properties of different tissues, both normal and abnormal. The rates are referred to as T1 and T2 and each yields different contrasts: T1-weighted images are best for anatomical details and T2-weighted images are best for pathological details. This technique provides better image contrast than X-ray computerized tomography in many instances (e.g. the patches of demyelination in the white matter of patients with multiple sclerosis), while the reverse is true in other instances (e.g. a meningioma in the posterior visual pathway). Usage includes the detection of optic nerve disease (e.g. glioma, optic neuropathy), retrobulbar neuritis, lesions in the chiasma and orbital tumours. In general, this procedure takes longer than X-ray computerized tomography (Fig. M3). functional MRI (fMRI) A non-invasive method used to map the various areas of the cortex, as well as brain tumour mapping, by observing brain activity in response to performing a task that engages a specific behaviour (e.g. tests of colour vision, face perception, motion perception, solving a mathematical problem). This is accomplished, within a conventional MRI scanner, by detecting the change in magnetic susceptibility of blood haemoglobin (and thus blood oxygenation) in various areas of the brain. During task execution when a brain region is active there is an increase in blood flow, which is more oxygenated and has a lower concentration of haemoglobin. This leads to a focal increase in MR image intensity, of around 1-5%, which can be detected using appropriate statistical methods. See visual association areas; radiology; positron emission tomography. Diagnostic radiologic modality, using nuclear magnetic resonance technology, in which magnetic nuclei (especially protons) of a patient are aligned in a strong, uniform magnetic field, absorb energy from tuned radiofrequency pulses, and emit radiofrequency signals as their excitation decays. These signals, which vary in intensity according to nuclear abundance and molecular chemical environment, are converted into sets of tomographic images. n also known as nuclear magnetic resonance imaging. It is a diagnostic technique in which the phosphorus in cellular tissues is excited by magnetic force. The distribution and alignment of these cellular elements can be captured on phosphorus nuclear magnetic resonance instruments forming a high-resolution tissue image. A higher degree of resolution of soft tissues is possible using this technique than from radiographic techniques. Q. Anybody to tell me more about MRI scan? had an MRIscan and this has snown adenocarcinoma of endometrium early stage There is no lymphatic involvement but is it possible an MRIscan to miss some tumor? A. MRI is a very effective machine but it has it's limits. it has a great resolution but will not see very small tumors. therefore- it can miss metastasis sometime. but if your adenocarcinoma is in early stage- it might not sent metastasis. they did a biopsy? that can give you some idea what to expect. Q. i lost a lot of hearing in my ears a couple of years ago,and i had a mri done,the mri said i had ETD, the ETD caused my eushation tube to close,its very uncomfortable,i dont feel the wind or air in my ears no more,i also feel fluid behind my ear drum,i lost a lot of inner hearing,its hard to hear my own voice,and nothing sounds clear,i also feel presser behind my ear drum from the fluid,i went to several doctors for this and i tryed medican and nothing worked,i tryed steriods for the influmation in my ears,that didnt work,i asked many doctors to drain my ears and give me venteling tubes,no doctor will do it,is there anyone out there that has the same ear problem that i do,and the doctors wont give them the tubes?why are the doctors not puting tubes in ears anymore?is it just me.or is everyone getting turned down for the tubes in there ears?i just feel so alone in this does anyone have the same problem and if they do could you share your experence,it would be nice to talk to someone that has the ETD ear problem like me,im in content discomfort,and i dont understand why nobody will help. Magnetic resonance imaging is a non-invasive and safe imaging modality and in current clinical practice magnetic resonance imaging is the first line investigation for the identification of suspected acoustic neuroma in appropriately selected patients. We are excited by the market response to our offering and the recognition of the value of our gateway to improved performance for the magnetic resonance imaging industry as a whole, which our product and technology set offers," said C.
Unlike magnetic resonance imaging, this technique can be used for studying the internal structure of metal alloys, composites and other materials. Nuclear magnetic resonance imaging, the technology that allows physicians to look at cancer cells and brain lesions, has for the first time been used to examine core samples taken from the ocean floor. NASDAQ: EPIX), a developer of innovative pharmaceuticals for magnetic resonance imaging (MRI), and Predix Pharmaceuticals, which has signed a definitive merger agreement with EPIX, announced today that the companies' presentation at the Needham & Company, LLC's Fifth Annual Biotechnology and Medical Technology Conference 2006 will be webcast live. OTCBB: BIPH; FWB: BTN), a developer of next-generation medical technology, today announced that it has entered into a research partnership with the US Food and Drug Administration (FDA) to help improve patient safety in Magnetic Resonance Imaging (MRI) environments. Biophan is focused on making biomedical devices that are safe and image compatible under Magnetic Resonance Imaging (MRI). Designers of medical systems, such as magnetic resonance imaging and patient monitoring receivers, which involve complex, multi-channel designs will benefit from the new converters which offer the highest signal to noise ratio (SNR) at 79dB, and deliver 16-bit precision at high IFs (intermediate frequency) and supporting sampling rates up to 130 MSPS (mega samples per second). NASDAQ: EPIX), a developer of innovative pharmaceuticals for magnetic resonance imaging (MRI), today announced that the fifty-second and final patient has been enrolled in the Company's Phase IIa study of its thrombus-imaging agent, EP-2104R.